I got some soil in my cob web sempervivum. Any tips on removing the soil without ruining the web? I tried a thin paint brush but the webs keep coming apart. Also, if the web is removed, does that affect how the plant grows? As you've found out it's really hard to get the tiny specks of dirt off the webbing! It won't hurt the plant to remove it, it's just there as an extra benefit and it will regrow in time. To remove the dirt, the paint brush system works sometimes. What I generally do is to let the dirt dry, then blow it off with either just your breath, or even a short blast from some compressed air. Be careful using this because the propellant is really cold and might damage the plant. Other ways to remove it is to use a vacuum, again, carefully, or to spray it with water or even dunk it right under the tap. 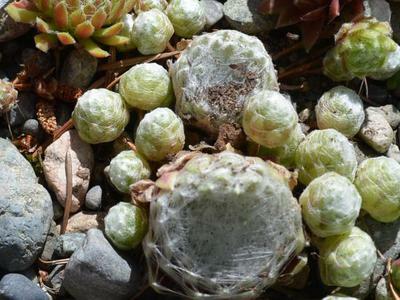 If you don't want to use any of those methods, just leave it and in time the rosette will grow, and the dirt either fall off, or disappear into the plant.